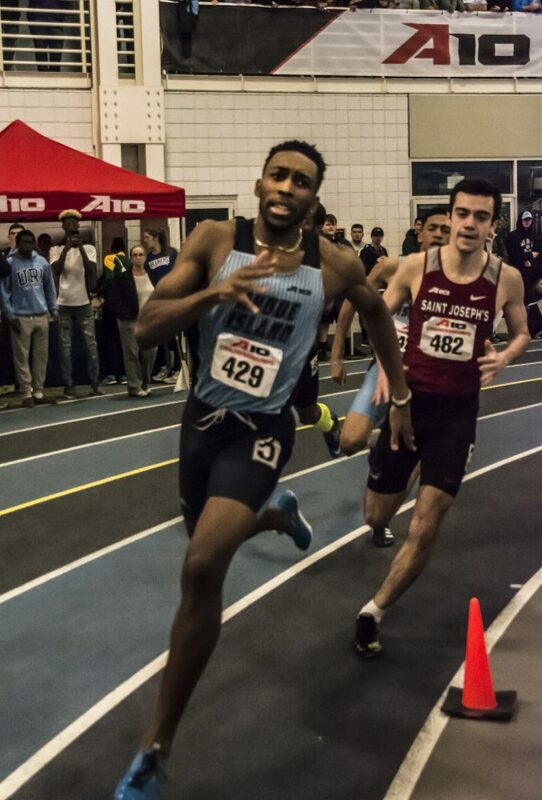 The University of Rhode Island men’s track and field program took home the Atlantic 10 Indoor Championship this past weekend at Mackal Field House. The women’s track and field team placed eighth in the A-10. The brightspot for the women’s team was a record setting day for senior pole vaulter Karlee Fowler. Fowler set a championship, program and venue record when she cleared 3.96 meters. URI tallied 204 total points over the course of the meet. The next closest and second place team was George Mason with 141.5 points. Points wise, Rhode Island has a comfortable advantage throughout the course of the weekend. On Saturday evening, after the first day of competition, URI was in the lead with 62 and the next closer was George Mason with 34. 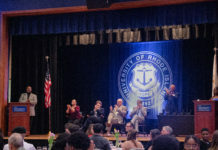 Rhody recieved big performances from Nigel Hill, John Kahrs and Casey Burley. Hill, a senior sprints runner, came in first place in both the 60 meter and 200 meter dash. Hill’s 6.75 second, 60 meter time is the best in A-10, URI and Mackal Field House history. Prior to this weekend, Hill’s best finish was third in the 60 meter dash during his sophomore season. Hill was named Most Outstanding Track Performer of the weekend. Kahrs tallied points for the Rams by taking home the high jump championship with a jump of six-feet-11.75-inches. Rhode Island had three jumpers in the top four for the high jump. Sophomores Eric Wicks placed second and Drew Nealey placed fourth respectively. Burley, Rhode Island’s triple jumper, won his fourth consecutive A-10 Indoor Championship. Burley jumped and eye-popping 50 feet to take home the crown and was named the weekend’s Most Outstanding Field Performer. Burley narrowed out two other Rams for the individual title. Nigel Riley’s jump of 47 feet, 5 ¼ inch placed second and Abdul Lateef-Orulebaja’s 46-feet-two-inch triple jump placed third. URI also had an individual winner in the 25-pound weight throw. Senior Brandon Amo was the only thrower to throw over 60 feet with a throw of 60-feet-three-inches. Amo took home the individual title and fellow senior Mahlik Handley placed second respectively. Both the men’s and women’s programs now prepare for this weekend’s meet at Boston University in the Last Chance Qualifier on Feb. 25. Bottom Left: Kristina Maclure and Breann Burns compete in the final run of the 60 meter hurdles. 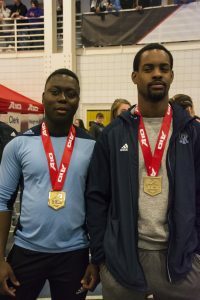 Bottom Right: Brandon Amo and Olusegun Vadis came in first and third in weight throw respectively.